Snrky: Who says developers aren't romantic? 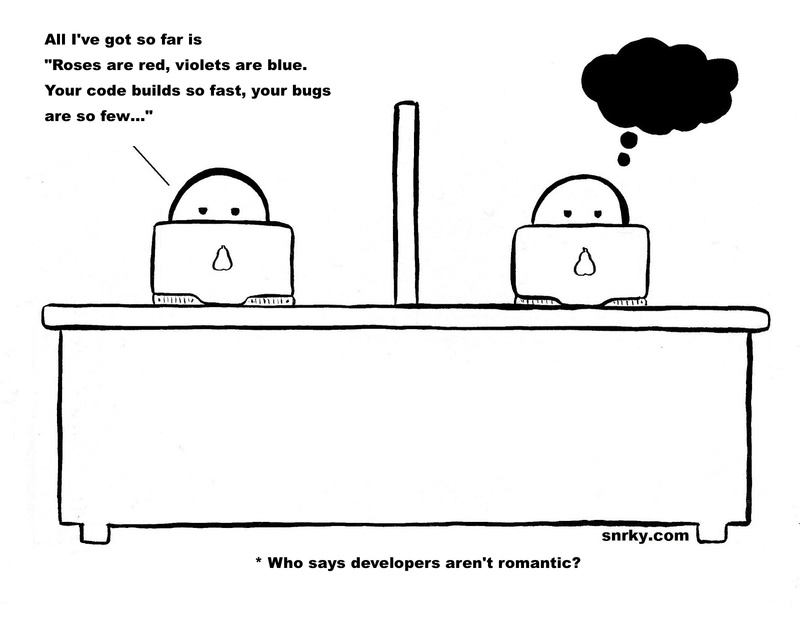 Who says developers aren't romantic? For the record, I have no idea what the last post means, but I DO recognize that it is geeky on entirely too many levels. That said, I love it. That's right, I said it. And since we're now on the topic, Happy Valentine's Day! How's that for a segway, segue? If poetry is not your thing. Here's a few ideas for your geeky loved one. Snarky: All I've got so far is "Roses are red, violets are blue. Your code builds so fast, your bugs are so few…"
You should have had a contest! "It's Valentine's Day, we're stuck in our cube, it's entirely inappropriate you brought me some lube." (or the SFW version: "let's give up on our code and watch some YouTube."